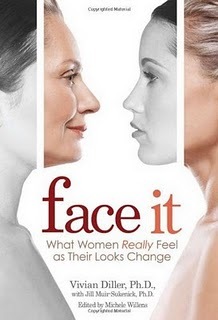 A few months ago Meredith Vieira from the The Today Show did a great interview with two former models-turned-therapists named Vivian Diller and Jill Muir-Sukenick who have written a wonderful book called Face It- What Women Really Feel As Their Looks Change. The book is also about aging with grace and switching our internal dialogue about aging from one of fear, to one of optimism. Forbes has an interesting & very useful excerpt from Face It on their site about the six steps to resolving the beauty and age paradox. I think one of the important things to mention about our generation is that we can’t look to our mothers as role models in one sense because they didn’t age during a time when society was asking them to try and be eternally young. For one thing our mothers didn’t have to an option to use botox and all the other face freshening options that are available to us now. For another, many of our mothers didn’t have careers and have to worry about how aging was going to affect their place in the work force. The authors of Face It say that we owe it to ourselves, and our daughters & nieces etc, to provide a better role model for growing older. Thank you doctors Vivian Diller and Jill Muir-Sukenick for your wisdom, and for writing such a thought provoking and optimistic book. Thank you for jumping on the bandwagon to help change the conversation. This is so true about how our mothers were not role models to our generation in 'trying' to stay looking young. Our mothers generation did age with grace and so did all the previous generations that preceded them. When did our generation become so obsessed with beauty? There is a missing link somewhere. When we expend so much energy in our looks where it becomes the main focus in our daily lives, we forget who we are. We rely on pleasing perfect strangers that surround us (society)so we can feel good about ourselves. The saddest part of it all is that we will never feel good about our outward appearance as long as we 'plug' into these unrealistic expectations that have been placed upon us through the media. We all need to Love ourselves deep within and live everyday with that feeling. We can't rely on external forces to make us feel youthful. When we chase after our youth, we lose out on the present moment of life. The life we have today. It is all about being happy with who you are now! Maria thank you again for your comment, and for your insight, and pure down to earth quality. The longer I write this blog the deeper it resonates with me that women so much want it to just be okay to grow older. We're seeking permission. The permission has to come from within each of us of course but it's great (for me too) to have this community of support around us. I like what you said about loving ourselves deep within and living everyday with that feeling. Maybe also a good question to keep in mind too is that at the end of our lives how do each one of us want to have had it be for us in terms of aging? I don't want to look back and see that it was a struggle. It really doesn't need to be. When did our society become so obsessed with beauty? That's a great question. My hunch is that it's very BIG business. I think the beauty industry is probably a gazillion dollar empire that spreads through our culture like wildfire because of advertising and the media. We have images flashed at us of what it is to be beautiful all day long. It's probably gotten to the point that people don't even know what is really beautiful to them personally because we're so inundated. "Seriously the older I get the more appealing a life like one on Little House on the Prairie is to me"
I also think the medicalization of women's bodies has a lot to do with why we're so obsessed with the beauty attached to youth. Have you noticed that everything that naturally occurs with a woman's body as she ages is some medical emergency? Hormones for menopause, surgery for lose skin (SURGERY FOR SKIN! Crazy! ), any period fluxuations needs a D&C, on and on. The marriage of the beauty and medical industries has been a pretty damaging one. I love that whole concept of life, as you will, as it was on Little House on the Praire! The simple life that the show portrayed is one of realness, peace and love. How could you not be attracted to that lifestyle when everywhere you turn today it is about things that don't touch one's heart and soul. The "beauty industry" and the "medicalization of women's bodies" is a huge business today. What a great point! Again it falls back on the idea of making material gains while preying on others to make them feel insecure if they don't meet the media's and society's standards. I too want to look back when it is my time to leave earth and say that my aging was wonderful and all part of life's cycle through birth til death. The human body houses the soul. The body is designed by nature to age and dissipate over time. It is not meant to be as it was from birth forward. I feel that we all need to take care of our body as it is a sacred creation. I feel that obtaining balance, finding one's center, and having self-love is the formula for aging gracefully. That's a very interesting point about the medicalization of women's bodies. I think anytime you fiddle with the body unnecessarily we are asking for trouble physically and emotionally. Women go through menopause and they give us hormone replacement therapy??? What??? Our bodies are probably saying what the heck is this? Why are you screwing with my natural chemistry? It's so unnatural. I think the side of effects can probably be more safely healed with acupuncture and massage or maybe a little soymilk. "The human body houses the soul. The body is designed by nature to age and dissipate over time. It is not meant to be as it was from birth forward." It's about time we equated aging with beauty!